I love holiday traditions. Each year my family dresses up and goes out together to a special Christmas concert in the days leading up to December 25th. Whether it’s at our local church or the theatre downtown, we get dolled up for Jesus. Okay, let’s be honest: my husband and children do it for me. And every year I hope and pray for one really good family picture of us together, with the boys wearing argyle sweater vests, and their hair combed back. Not a dozen pictures, mind you, just one special keepsake of a treasure where we all look happy. Happy is the goal. I struggle with happy sometimes—especially around the holidays. Which feels ridiculous because we’re all singing, “Tis the season to be jolly…” But all the falalalala-ing in the world can’t hide the fact I struggle with depression each December. There are plenty of reasons and I can’t list them all, but I’m going to list and few because I know I’m not the only one. I’m not a psychotherapist here to explain them all, just a sister in the Holly-Jolly trenches, humbling sharing what I, and pointing you to the One who knows it all. Here are a few of the pressures that press in on me at Christmastime. Family stress. Family pressure over where we’re going to be Christmas morning, and therefore where we aren’t going to be, can steal our focus and rob our joy as well. Whose turn is it to host; which in-laws will we be with; and how long will we stay before we leave for the next stop on the Christmas train? When what we really want is to be home with our stockings and eggnog, watching Elf by ourselves. The guilt compounds the sadness. It’s Christmas after all. Unrealized desire to feel close to God. The pressure to focus on “the reason for the season” amidst all the hustle and bustle, can make us feel terrible too. Feelings of failure when we only read the first three chapters from our advent devotional is the straw that often breaks the camel’s back. Speaking of camels, I’m reminded now that I never even got my nativity set out of storage and onto the mantel this year. The sugar. While many of my most favorite traditions are packed with sugar (then dusted with powdered sugar), the truth of the matter is that sugar doesn’t help me when I’m hurting. Sugar doesn’t make me sweet when I’m sad. Sure, it lifts my Christmas Spirits for a Merry-Moment, but before I know it I’m crashing down again. It is simply what sugar does. At Christmastime especially, with all the special treats, we can feel like we’re riding a teeter-totter on a merry-go-round. We want to be happy, but we’re dizzy and tired. We want to get off, but we can’t. We need another piece of peppermint bark with our white chocolate mocha to bring us back up again. While sugar seems like the most unspiritual of all the bullet points above, the reality is that God is the only thing, the only One, we should run to when we’re in pain — at Christmastime or anytime. We need to stop reaching for the next sugar high and start reaching for the Most High. 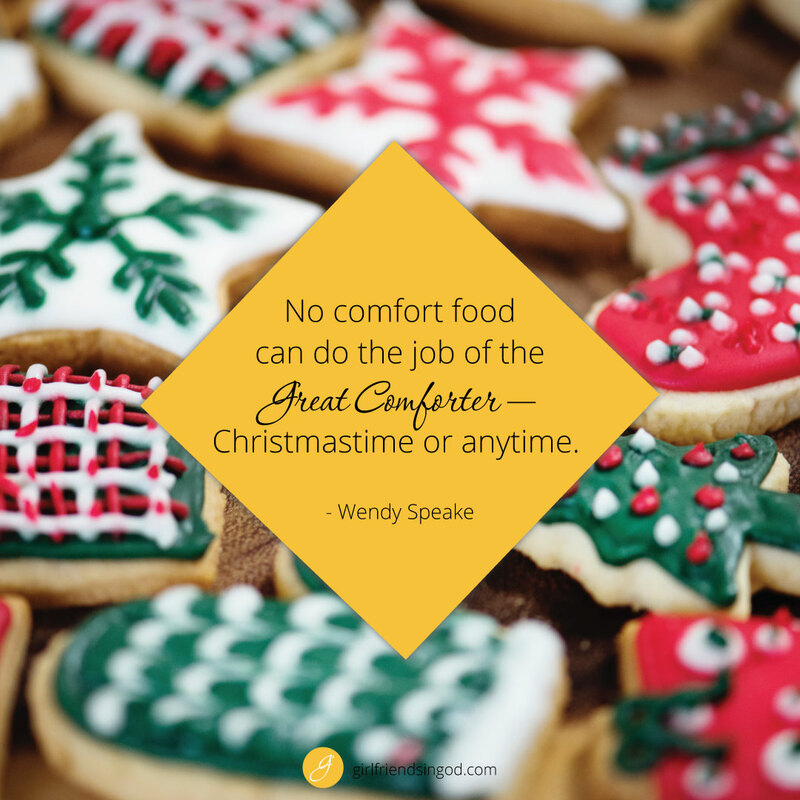 We must learn to run to the Great Comforter rather than comfort foods. Perhaps, in your sadness you run to the mall for another session of retail therapy. But that’s not the therapist you need either. In one of the most familiar Christmas passages, Isaiah prophesied that the Messiah would be called a “Wonderful Counselor”. If you are desperate for “comfort and joy” this Christmas, let me encourage you to limit your sugar intake. While it seems like a very unspiritual first step, physiologically it might be just what you need to spiritually run to The Most High rather than the next sugar high. Sugar’s help is temporary (and really no help at all.) But the Most High is eternal and can lift you up in your present struggles into His forever arms. When you’re tempted to run to sugar this Christmas, run to the satisfying sweetness of our Savior. He’s a Wonderful Counselor. When you’re tempted to put your hope in a leftover cookie and the quick dopamine release that will make you feel good for a while… put your hope instead in God. Dear Lord, Thank you for being my Wonderful Counselor and the Prince who is my peace and brings me peace. I don’t need retail therapy, I need you. And I don’t need to self-medicate with sugar to relieve my pain either. I need Your great comfort. Thank you for coming to earth as my Savior. Teach me to know this Christmas that Your saving isn’t just intended to get me to Heaven. Your saving is available today, and this whole holiday season, each time that I struggle. Do you struggle with depression at Christmas? Perhaps you feel convicted about your sugar addiction, that goes through the roof each this time of year. The application is the same for you too. Let’s run to God rather than to that leftover piece of pecan pie this afternoon. Limit your sugar intake, so that you might experience the satisfying sweetness of the Savior we celebrate at Christmastime! If you struggle with sugar addiction, at Christmas most of all, join Wendy Speake for her fifth annual 40 Day Sugar Fast this January. Every year thousands of women sign up for forty days of fasting from sugar and feasting together on Christ and His satisfying word. Waistlines decrease as faith lives increase! It’s an incredible time of physical and spiritual transformation and it all begins January 8th. Sign up today. Oh,my goodness….this devotional was meant for me! Never put the “sugar ingredient” into my Holiday feelings of not being enough, to friends, family and Jesus. Now, I know I am enough, to feel God’s love and comfort. I am from the Caribbean and I have learnt over the years to just let go. This year the Christmas tree did not go up. I just could not deal with the hustle and bustle. In the years gone by I would be depressed leading up to Christmas but I realised when I do something that makes me happy I feel less depressed. A beautiful devotion, thank you!